Google highly recommends that every webmaster sign up with Google Webmaster Tools and configure the message center to forward all notifications to an email address. It is smart advice and I doubt any webmaster would argue with it. But if you want to go ahead and do that now, you are temporarily out of luck. 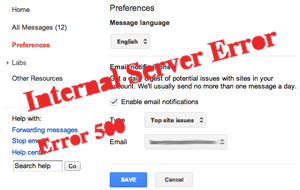 Going to your message preferences in Google Webmaster Tools and enabling it will return a 500 error code and it doesn't save the preference that you want notifications to go to your email. Thanks for the reports, everyone! We've pinged the team to have them take a look. I've confirmed the issue and it is currently still not resolved.